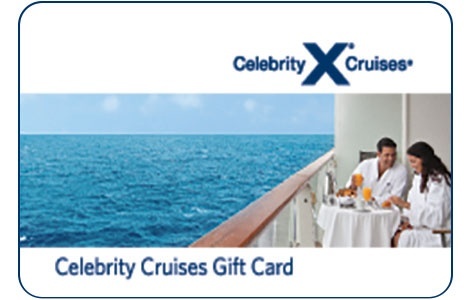 Celebrity Cruises' gift cards, available in denominations from $25-$500, offer the ultimate in travel experiences. Use the cards towards any new reservation and with no expiration date, take your time finding the perfect cruise for you. Celebrity Cruises' iconic "X" is the mark of the world's top-rated premium cruise line, with spacious, stylish interiors; dining experiences elevated to an art form; personalized service, with a guest-to-staff ratio of nearly 2:1; unexpected, trendsetting onboard activities, all designed to provide an unmatchable experience for vacationers' precious time. Celebrity sails to Alaska, Australia/New Zealand, Bermuda, California, Canada/New England, the Caribbean, Europe, Hawaii, the Pacific Coast, Panama Canal, South America, and year-round in the Galapagos Islands. One of the fastest-growing major cruise lines, Celebrity's fleet currently consists of nine ships, all of which ranked in the "Top 10 ships" in Berlitz Complete Guide to Cruising. For more information please visit www.celebritycruises.com. The following explains Celebrity Cruises Inc. policies regarding the purchase and use of this gift card (the "Card"). By purchasing, redeeming or otherwise using the Card, you hereby agree to accept and comply with these terms and conditions. 1) This Card is valid only for Celebrity Cruise sailings and can ONLY be used for new bookings. The applicable cruise must be booked at least ten (10) business days prior to the sail date. Celebrity will apply the face value (in US dollars) of this Card against the cruise fare including taxes and fees (but excluding gratuities) for the qualifying booking. 2) Cards are not redeemable for cash and cannot be returned for a cash refund, except to the extent required by law. Gift card cash value is 1/10 of one cent. . This Card cannot be used to settle any ship board charges, including but not limited to gift shop purchases, casino debts, shore excursions or gratuities. This Card is not valid on any other cruise line, including any affiliate or subsidiary of Celebrity Cruises Inc.
3) You may pay Qualifying Charges using one or more Cards. You may supplement payments made using a Card with other acceptable forms of payment. The value of the Card will be applied towards the cost of the Cruise prior to the application of any other payment method accepted by Celebrity. Should the value of the card exceed the eligible costs towards which the Card may be applied , Celebrity will provide the excess to the holder of the Card in the form of an onboard credit the unused balance of which shall expire at the end of the cruise. 5) Any guest booked on a Celebrity Cruise must satisfy all applicable requirements including but not limited to any applicable minimum age requirements. All guests must sign the applicable passenger ticket contract prior to boarding the vessel. 6) To redeem this Card call (888) 837-5676. 7) Changes to the reservation may be permitted, subject to availability and any other restrictions and any applicable cancellation charges. No refunds after booking is made and paid in full. 8) Lost, stolen or damaged cards replaced only with valid proof of purchase. Cards that have been altered, photocopies of Cards or other reproductions are void. This Card is void if sold for cash or other consideration. This Card is transferable only when gifted. 9) This Card cannot be used and is not applicable for charters and may not be used for customized group programs (i.e. value add groups). 10) Any tax liability, including disclosure, connected with the receipt or use of this Card is the Holders sole responsibility and liability. 11) This Card is only valid to legal residents of the United States only (excluding Puerto Rico). This Card can only be purchased by and mailed to U.S. residents. 12) This Card shall be void where prohibited or restricted by law. 13) This Card shall have no expiration date and there are no fees. 14) The provisions of Celebrity Cruises Cruise Ticket Contract (copies of which are available online at www.celebrity.com) are hereby incorporated by reference. IMPORTANT NOTICE: THE CRUISE TICKET CONTRACT CONTAINS IMPORTANT LIMITATIONS ON THE RIGHTS OF PASSENGERS. Among other things, any disputes between you and Celebrity Cruises Inc., must take place in Miami/Dade County, Florida and must be filed within a certain period of time. By purchasing/redeeming this card, the purchaser/holder agrees to be bound by all such terms and conditions.